Would you agree that FINDING TIME for your most important life goals is often difficult to do when you are juggling a busy schedule? There’s no doubt about it – if you remain disconnected from your life goals and aspirations, big or small, you will always feel unbalanced and unsatisfied. Take Deb Hardy, for example. Deb is a 48-year-old creative spirit who lives in Seattle. When I first met Deb, by day, she enjoyed her job at a large technology firm, so much so that she put all her energy into it. But, by night, she had little to nothing left for anything else when she got home, except a little TV watching and internet surfing. Can you relate? All work and no play, well…you know the how the saying ends. Fortunately, through The Washington Post’s Timehacker project, I was paired with Deb to help her solve the problem of finding time to live her life more fully and creatively. Identify your top five values. Once you do, it’s easier to see if your actions are in line with your values. And if they’re not, once you have a clearer idea of what’s important, you’ll have more impetus to change. Schedule time for fun first, before anything else. Otherwise, you’re trying to “squeeze” it in, and that rarely works. When you schedule something, it shows it’s significant to you, and you’re more likely to follow through and make it real. Figure out what you have to let go of in order to make time for what you really want. Ask people you trust for their honest opinions and constructive feedback of how you spend your time. Find the space, not just in the calendar, but the physical space, to create art, and make the space inviting and organized, so you’ll be drawn to spend time there. You can read more about Deb’s journey to finding time, including how she applied the above tips (and more!) to her life and what challenges she overcame in doing so, in the full article in The Washington Post. 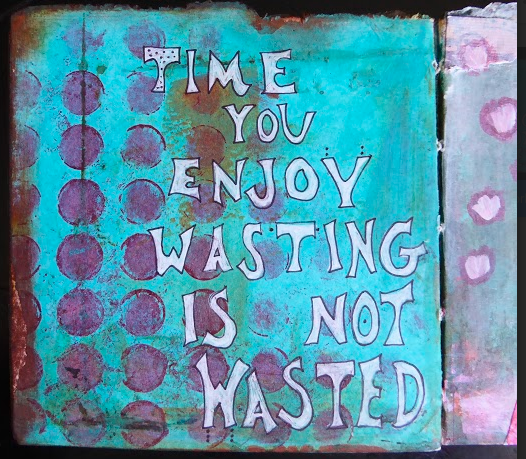 Time you enjoy wasting is not wasted. Well said, Deb! Truth is, you can’t be your most productive self unless you take time to relax, rejuvenate, and regroup – and enjoy your life goals as you go. Carmen Coker is a former US Air Force officer turned professional organizer. Thousands of busy people have benefited from her expertise featured by CBS, NBC, The Washington Post and Real Simple magazine – now it’s your turn! If you want to get organized and calm the chaos in your life, go to CarmenCoker.com for her free video how-to called the Secrets of the Super Organized™.